Kitchen & Beyond Corp Makes its mark in the kitchen cabinets Industry by fullfiiling a much needed new approach to the old problem of purchasing custom cabinets. It's a popular belief that in order to have perfect fitting cabinets, you have to spend thousands of dollars by hiring designers and creating the cabinets from scratch. 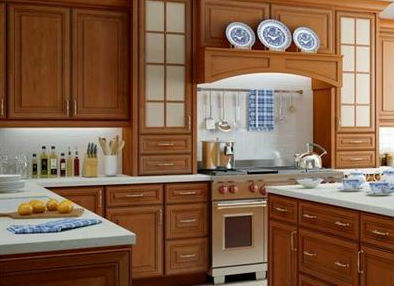 At Kitchen & Beyond Corp our Master Cabinet Makers can reduce the cost of custom cabinets by altering any stock Cabinet, changiing the color and look into a masterpiece. Kitchen & Beyond can do most anything you can imagine, from adding larger appliances, rollout trays, lazy susans and much more. With the artful skill obtained after years of Cabinet building, Kitchen & Beyond can merge old and new cabinets into one uniform look. Tommy Cruz, recognized Master Cabinet Maker tells us that " We are concerned with the final look and feel, that is why we only use the highest quality products. Our superior finishes, including pigment and dye stains, glazes and opaque and clear finishes all surpass the standards established by the Kitchen Cabinet Manufacturers Association (KCMA). Most importantly we can transform your outdated cabinets or newly purchased ones,into modern sophisticated elegance, and we provide expert installation every time"
"Our company is based on the belief that satisfying our customers' needs is our primary concern. Our entire team is dedicated to meeting those needs. As a result, a high percentage of our business comes from repeat customers and referrals."